Russian illustrator and stage designer Ivan Yakovlevich Bilibin (1876-1942) was inspired by Slavic folklore, Russian folk art and traditional Japanese prints. 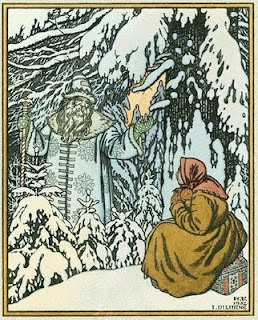 He visually interpreted classic Russian folk tales including an illustration of Ded Moroz or Father Frost. Originally the grandfatherly figure was a sinister sorcerer who turned adults into ice and kidnapped children, carrying them away in a large sack. He evolved into the Russian Santa Claus who brings presents in his sack for children, warming their spirits in the cold of winter. 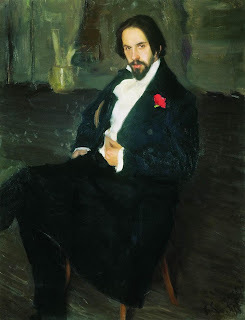 A young Bilibin was portrayed by Russian painter and stage designer Boris Mikhaylovich Kustodiev. 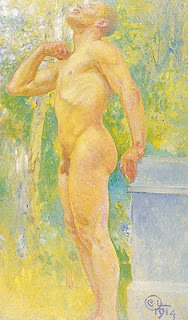 Swedish painter and interior designer Carl Larsson (1853-1919) depicted a mid winter legend from Norse mythology, Midvinterblot. 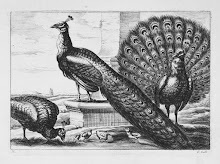 It is the story of King Domalde who's kingdom had suffered three years of famine and starvation. The first year the Swedes sacrificed oxen to the Norse gods, the second year men and the third year the king was killed. Domalde's blood was sprinkled as an offering to the gods to insure fruitfulness. Larsson who is shown in a self portrait considered the finished mural his finest work. The figure study is of the ill fated king.